Spying was an established profession in Latin America centuries before the Spanish and Portuguese conquerors arrived, even though the pre-Colombian civilizations were Stone Age cultures. Prophetic literature of the Maya describes a Toltec military order of spies in Yucatan symbolized by the weasel, who sucked the blood of its enemies. Rulers employed internal intelligence services to monitor the pulse of the populace, identify political rivals, and stay abreast of chatter among the upper castes of priests, merchants and warriors. External intelligence arms gathered strategic information about other realms and communities. Spies from neighboring city-states wandered throngs at public rituals marking the succession of new rulers, gathering information to gauge whether the new leader would be belligerent, cooperative or perhaps pliable via tribute, cajoling or threats. Ancient rulers also gleaned intelligence, as well as goods, services and slaves, from an extensive system of overland and maritime trade. Traveling artisans and wanderers sold—or were compelled to pass on—strategic information, and long-distance merchants, who represented trade houses controlled by wealthy nobles, were obliged to double as spies, as well as couriers and diplomats. 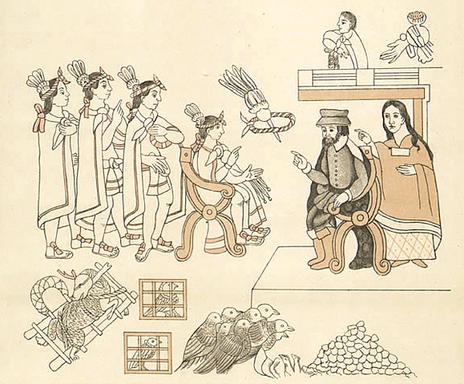 Malinche (far right) advises Cortez (with beard) in dealings with Mayan leaders. Intelligence played a pivotal role in the Conquest. Vastly outnumbered and unknowledgeable of American languages, geography, sociology and politics, Spanish conquistadors had to rely on locals to communicate, navigate, analyze and advise. A woman referred to as Malinal, Malintzin or La Malinche remains a controversial figure for her role in facilitating the Conquest. Born in 1505 to a prominent merchant, her mother sold her into slavery after the death of her father. Torn from a comfortable homelife in the Yucatecan town of Paynalá, the transient life of a slave forced her to discover a talent for learning languages. Her personality and intelligence distinguished her among 20 slavegirls presented to Hernan Cortez after his 1520 victory at Tabasco. She became his Maya and Nahuatl interpreter and confidante, interrogated prisoners and spies, and helped Cortez create a system of intelligence crucial to victory over Tenochtitlan the following year. The brave, defiant and resourceful Malinal was baptized Doña Marina and revered by the Spanish, though Mexican lore vilifies her as a traitor. ​Eventually the educated upperclass of colonial Latin America expanded the region’s horizons beyond pre-Colombian trade routes, exposing an elite few to revolutionary ideas emanating out of North America and Europe. Secret revolutionary organizations infiltrated Spain’s American colonial administrations and led the colonies in revolt. Like George Washington in Great Britain’s North American colonies, many of the greatest names in the struggle for Latin American independence belonged to underground Masonic organizations dedicated to fraternity, freedom and equality. Buenos Aires’ Logia Lautaro, the Lautaro Lodge, became an underground catalyst for leaders of the independence movement. ​The founder of Lautaro Lodge, Sebastian Francisco de Miranda, became the godfather of the Latin American revolution. He led Spanish troops in Mississippi and Florida who assisted the North American colonies’ fight for independence, and met George Washington, Alexander Hamilton and Thomas Paine. Miranda fought in the French Revolution and conceived the name “Colombia” for a united, independent Latin America, yet failed in his 1806 invasion of colonial Venezuela even though he had been able to garner British assistance. He influenced a generation of freedom fighters, including a young North American volunteer named David G. Burnett who would eventually become an interim president of the Republic of Texas. Miranda’s demise foretold the century of treachery that would follow Latin America’s long bloody struggle for independence. At the invitation of General Simon Bolívar Palacios, Miranda returned to head newly independent Venezuela in 1811, but was betrayed to the Spanish Royalists one year later by Bolívar and fellow revolutionaries who mistakenly believed that Miranda had betrayed them. 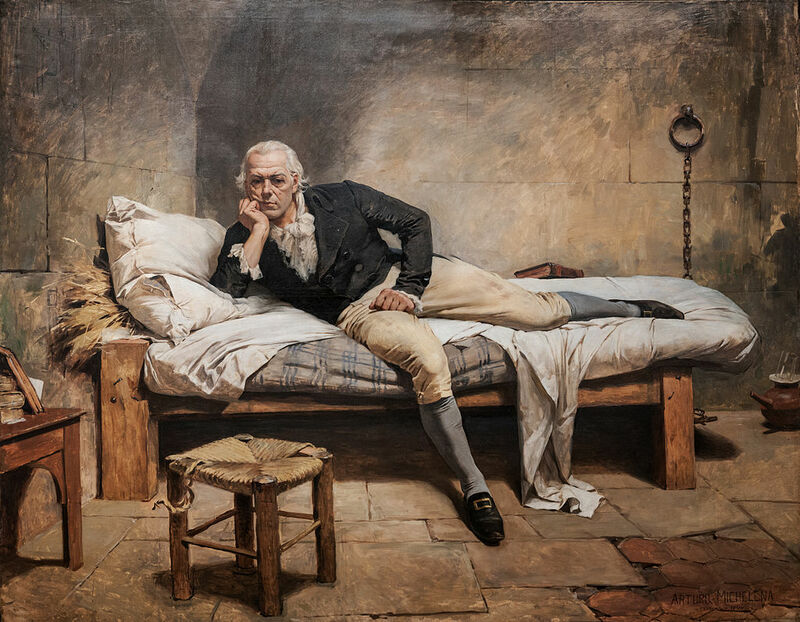 Ominously the father of Latin American independence died in a Spanish prison, forsaken by his heirs, an unfortunate victim of the fear and suspicion that readily breeds in a culture of secrecy. Sebastian Francisco de Miranda perished in a prison cell near Cadiz, Venezuela in July 1816, and was buried in a mass grave.